Copies of this supplement were distributed at the Galileo Back In Italy II conference in Bologna Italy 26-28 May 1999. Vladimir Sekerin felt he could explain Cepheid variables using Ritz's c+v effects. This page is a continuation of that idea. The cyclic color changes of Cepheid variables appear to be consistent with Ritz c+v information arrival time modulation. 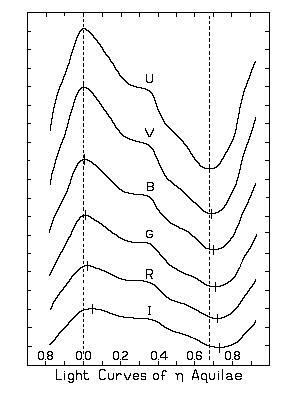 This modulation is such that during a brightness peak there is a time-wise compression of the observed spectrum, which produces higher observed frequencies. If there were to be evenly spaced time markers impressed on the luminous flux (at the source) we would see that their time-wise spacing decreases during the bright phase, reaching minimum separation at the brightness peak. During the lower intensity "trough" of the light curve the time markers would be stretching further apart, reaching maximum separation at minimum intensity. As the arrival time "clock" varies in speed, the stellar spectrum changes in color (Hottest at peak, coolest at trough.) Here, we are considering a bright star with a dim (mostly unseen) companion. About 90 percent of published Cepheid variable light curves resemble case (4), fast rise-slow decay (FRSD). About 10 percent present symmetrical curves that that could be classified as either case 1 or case 3. In the Cepheid variable studies I have seen, Case 2 slow rise-fast decay (SRFD), light curves are extremely rare, less than one percent and those published are very close to being symmetrical. The extinction theorem predicts that higher frequencies (this has to be qualified) will have longer extinction lengths than lower frequencies. This is based on the idea that electrical charges in the interstellar medium interact less readily with higher frequency electromagnetic perturbations than with lower frequency perturbations. The following fiture shows light curves of the Cepheid Variable Eta Aquilae, HD 187929. (Spectral type F6-G2.) From Stebbins, Kron, and Smith(1). U = Ultraviolet, V = Violet, B = Blue, G = Green, R = Red, I = Infra-Red. 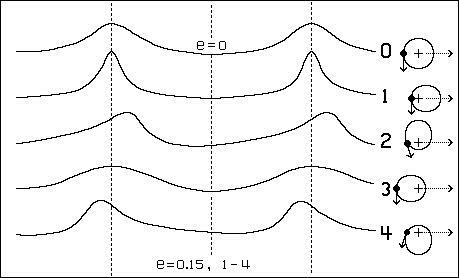 Note that the amplitudes of the curves increase with increasing spectral frequency. This is consistent with the extinction theorem. At frequencies below the x-ray spectral discontinuities extinction distance is proportional to frequency. In regard to Eta Aquilae, the Guide 6.0 "More Info" web page reports that the Henry Draper Catalog says, "UV data suggests an A0V companion." (Scan the page for HD 187929.) A note to the same effect for this star, along with a spectrocopic binaries note, is given in the alcyone star data for Cepheids of the delta-Cephei type, as reported in the Bright Star Catalog. The source code for d-Cephei.bas can be saved to disk and run using Microsoft QuickBASIC or QBASIC. An executable version, d-Cephei.exe, may be saved and run in DOS without the QuickBASIC software. (1) Stebbins, J., Kron, G.E., and Smith, L. (1951) Ap. J, 115, 292. Don't miss the first line in the last paragraph of this very informative article. This research has made use of NASA's Astrophysics Data System.